Traigh Lingeigh Beach is located on North West coast of the Isle of North Uist in the Outer Hebrides. It’s actually only a stone’s throw from the Caledonian-MacBrayne ferry terminal. 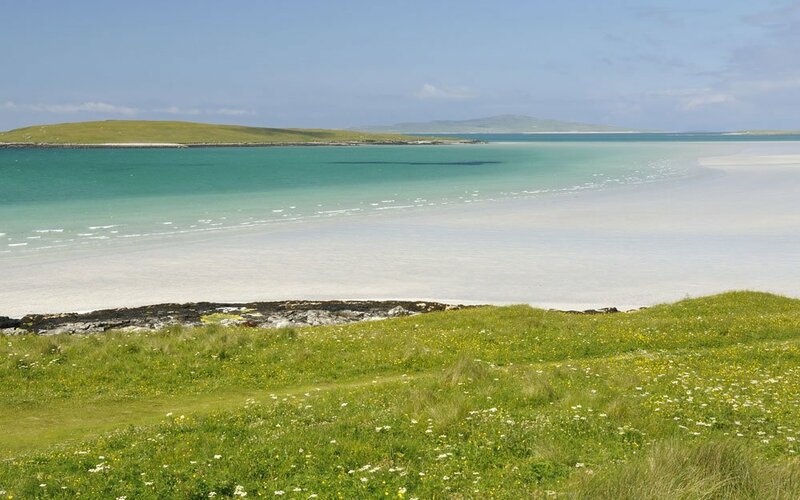 Like many Hebridean beaches, it features white sand and crystal clear water. It’s a shallow beach, and protected from the waves, making the ideal freestyle wakestyle venue. At low tide it’s only a few hundred metres to the island of Lingeigh. Traigh Lingeigh will work on winds from W to NE. The best being from the NW. Traigh Lingeigh can be ridden at all states of tide, low tide brings large flat water lagoons. Traigh Lingeigh could be a great spot for beginners due to the shallow, flat water. However, the outer hebrides is quiet, you might not see another kitesurfer so you need to be confident kiting alone. The flat, shallow water makes this an excellent freestyle / wakestyle venue. A few rocks to watch out for. Use the map below for an exact location. It's only around 4.5miles down the B893 from the Caledonian-MacBrayne ferry terminal.